Create tables and columns. Add functions and validators. Adds an entry to the TABLES table. Deletes selected rows from TABLES table. Specifies poco fields DataMemberAttribute.Order property. Checking suppresses table code generation in the typed dataset class. Untyped access will be granted. Checking suppresses the view code generation in the viewmanager class. Checking suppresses POCO code generation for the table. Typed datasets property name for the table. Typed viewmanagers property name for the tableview. When checked "Table Class Name" is inferred from "Table Class Name Format" (see Project/DataSet) and table name. 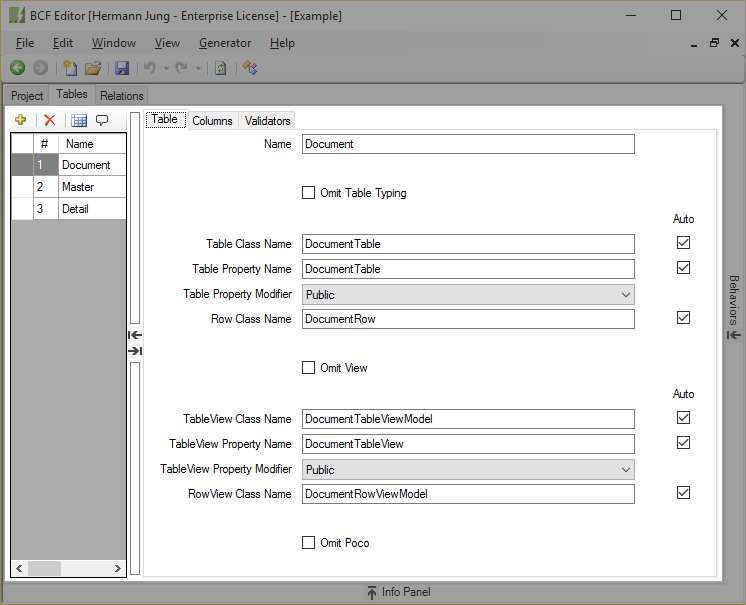 When checked "Table Property Name" is inferred from "Table Property Name Format" (see Project/DataSet) and table name. Modifier of typed datasets property name for the table. When checked "Row Class Name" is inferred from "Row Class Name Format" (see Project/DataSet) and table name. When checked "TableView Class Name" is inferred from "TableView Class Name Format" (see Project/AllViews) and table name. When checked "TableView Property Name" is inferred from "TableView Property Name Format" (see Project/AllViews) and table name. When checked "RowView Class Name" is inferred from "RowView Class Name Format" (see Project/AllViews) and table name. Adds an entry to the COLUMNS table. Deletes selected rows from COLUMNS table. Shows/enables the column name filter. Opens the Data Type Browser Dialog. 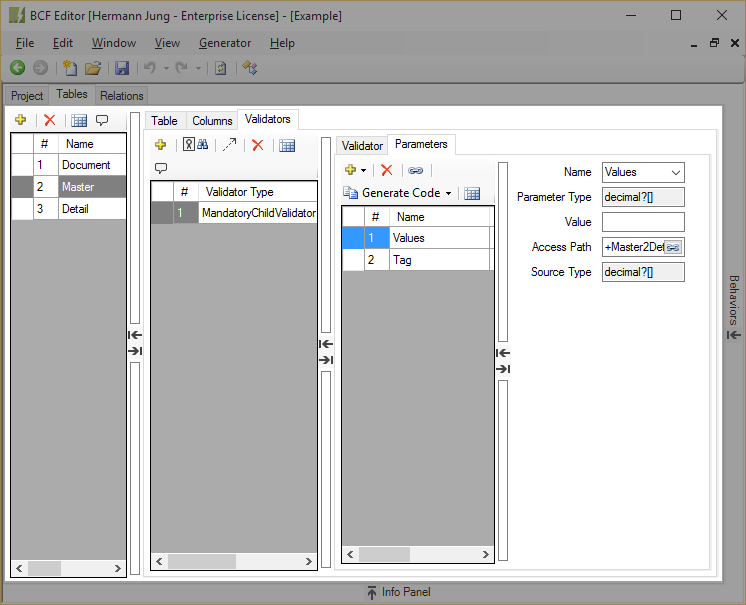 Opens the Function Type Browser Dialog. Opens the Column Dependencies Browser Dialog. You may omit namespace when namespace is mentioned in References/NAMESPACES. Determines whether column will accept null value. Unchecking will add a not-null-contraint to the column behaviors. Specifing a default value will add a BcfColumnDefaultValueSourceT to the columns behavior. Determines if column is (a part of) the tables primary key. Checking suppresses the property generation in the typed row class. Checking suppresses the property generation in the typed RowView class. Checking suppresses the field generation for the column in the poco class. Determines if column is read only. If not checked function will not be executed parallel. Typed table property name for the column. 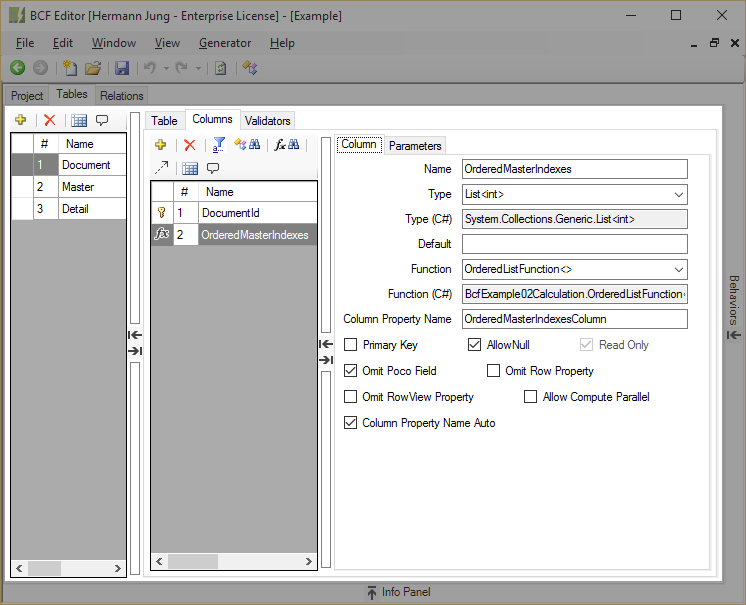 When checked "Column Property Name" is inferred from "Column Property Name Format" (see Project/DataSet) and column name. Add All - Adds an entry to PARAMETERS Table for each missing function parameters. Add Mandatory - Adds an entry to PARAMETERS Table for each missing mandatory function parameters. Add Empty - Adds an entry to PARAMETERS Table. [NAME] - Adds an entry with [NAME] to PARAMETERS Table. Deletes selected rows from PARAMETERS Table. Opens Access Path Browser Dialog. Generate code and set to clipboard. Function Difference - If function class name was not recognized a function template code will be copied, else property code of unrecognized parameters will be copied to clipboard. Optional Parameter(s) - Creates code for selected parameters and decorates properties with BcfPropertyAttribute. Mandatory Parameter(s) - Creates code for selected parameters and decorates properties with BcfMandatoryAttribute. Indicates whether parameter assignment is mandatory (parameter property is decorated with BcfMandatoryAttribute) or not. Parameter assignment always ends with a column name. Parameter assignment may start with Relation-Steps. When BCF collects parameter input it starts with current row; follows rows along the Relation-Steps (prefix "+" means "ToChild" and "-" "ToParent"; suffix "%" means distinct rows and "*" all rows) and fianlly takes value from column mentioned at parameter assignment end. If any relation step is "ToChild" a value array will be taken. See also Access Path Browser Dialog. Constant expression to use as parameter value. Editor evaluated type depending on "Access Path" and source column type. Parameter property type in function class. Parameter assignment always ends with a column name. Parameter assignment may start with Relation-Steps. When BCF collects parameter input it starts with current row; follows distinct rows along the Relation-Steps (prefix "+" means "ToChild"; "-" "ToParent") and fianlly takes value from column mentioned at parameter assignment end. If any relation step is "ToChild" a value array will be taken. See also Access Path Browser Dialog. Suppresses "Parameter Column Association with potential circular reference" warning. Warning may occur when using parameter access via self joins. The similar error "Parameter Column Association with unavoidable circular reference" can not be suppressed. 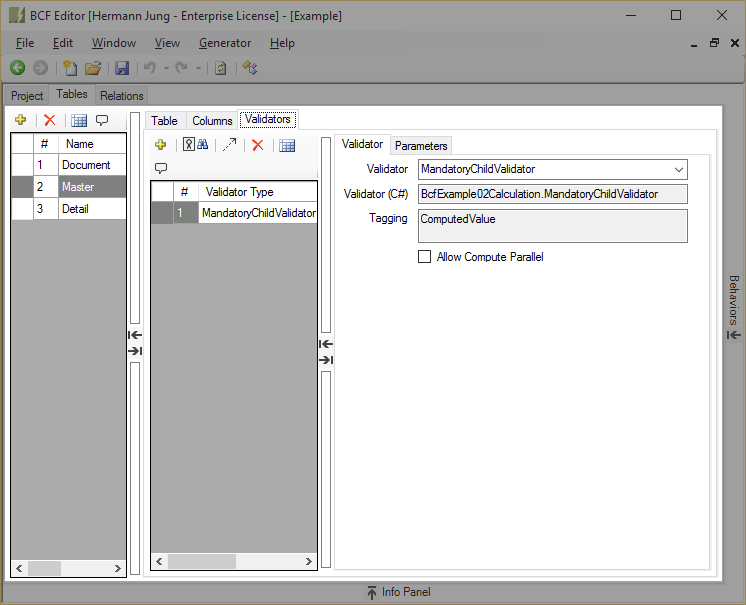 Adds an entry to the VALIDATORS Table and opens the Validator Type Browser Dialog. Opens the Validator Type Browser Dialog. Deletes selected rows from VALIDATORS table. A ";"-separated list of parameters to tag. If not checked validator will not be executed parallel. Add All - Adds an entry to VALIDATOR PARAMETERS Table for each missing validator parameters. Add Mandatory - Adds an entry to VALIDATOR PARAMETERS Table for each missing mandatory validator parameters. Add Empty - Adds an entry to VALIDATOR PARAMETERS Table. [NAME] - Adds an entry with [NAME] to VALIDATOR PARAMETERS Table. Deletes selected rows from VALIDATOR PARAMETERS Table. 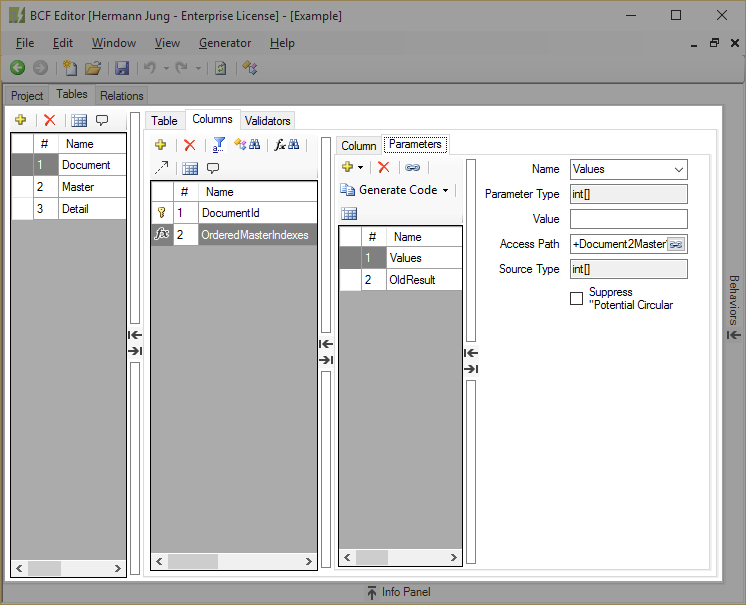 Opens Parameter Access Path Dialog. Validator Difference - If validator class name was not recognized a validator template code will be copied, else property code of unrecognized parameters will be copied to clipboard. Determines whether parameter source cells will be tagged with the validator message or not. Parameter property type in validator class.